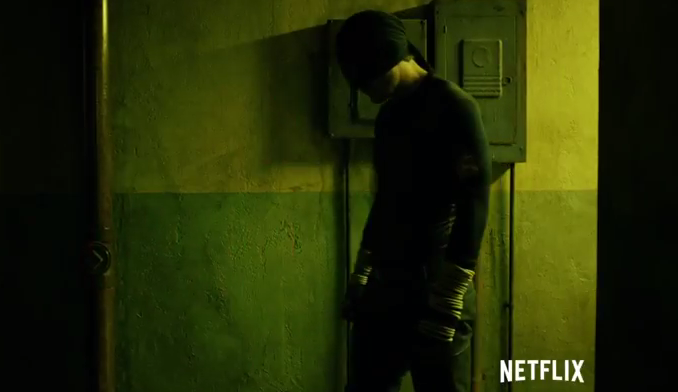 The first full-length trailer for Netflix's Daredevil series has finally arrived and it doesn't disappoint. Just like the teasers thus far it is dark, in tone and visuals, and has narration from the Kingpin (Vincent D'Onofrio) to kick things off. The trailer features closer looks at Matt Murdock (Charlie Cox) as Hell's Kitchen blind vigilante, Daredevil, his love interest played, Karen Page, by Deborah Ann Woll and lots of Kingpin. It's a gritty dark affair that harkens to its comic book roots. This is just the first miniseries for the Marvel/Netflix collaboration that will include three more of these minis starring Jessica Jones, Luke Cage and Iron Fist. It will all come together in a team-up movie called The Defenders. "A City Without Hope. A Man Without Fear." Marvel's ‪#‎Daredevil‬ only on Netflix April 10. It’s time to let the devil out. Marvel’s Daredevil is here to clean up the streets of Hell’s Kitchen, New York. Lawyer by day, street-level hero by night, Matt Murdock is on a mission to make his city a better place against an underground terror within the city. All episodes arrive only on Netflix, April 10.